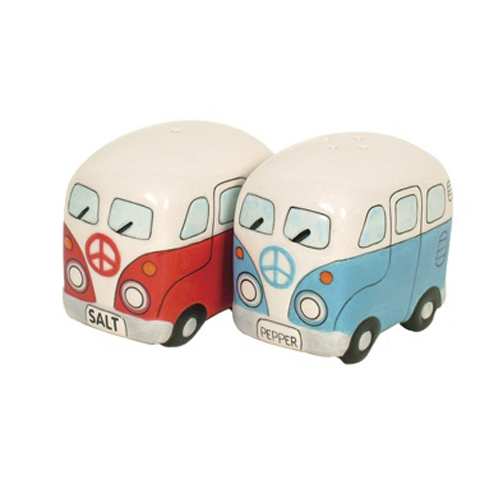 If you’re looking to bring the essence of Kiwi summers past to your dinner table, look no further than this couple of Kombi Van salt & pepper shakers! The retro charm of the red and blue Volkswagen Type 2 is captured here in two sturdy porcelain salt and pepper shakers. Otherwise known as the Kombie Van, the VW Type 2 became a common sight on the campgrounds and beaches around New Zealand in the 1970s. Now it can take up residence in your kitchen at a fraction of the size and cost! Equipped with handy descriptive license plates, these shakers are incredibly easy-use, including a discreet replaceable plug at the bottom which makes refilling a breeze. Spicing up any meal has never been so easy, and transport-related!